ombies are bona fide. They come lurching at you a priori, self-evident amid postmodern nescience. What do they want? Your brains. How should you respond to that demand? Armed resistance, preferably a shotgun. One year ago, when Valve Corporation set loose multitudes of the hungry dead, and redressed Valve head Gabe Newell's lament over first-person titles serving as "shooting galleries," it culminated two eagerly and repeatedly attempted genres. Encore Left 4 Dead 2 accounts for a lack of novelty with the satisfaction of subtle expectations. Conventions dictate, as they should. Four strangers meet and, no questions asked, band together to escape a Deep South whose disease-infected population walks the streets as mindless cannibals. Scavenged weapons and medicine, to fend off the Infected and stay alive, are ample, but teamwork between the Survivors is utmost: among swarms of undead are eight unique mutations, each capable of severe injury or incapacitation. Three new forms — the Spitter, Charger, and Jockey — join five from the first game (the Hunter, Smoker, Boomer, Witch, and Tank). Like their fell brethren, these Infected alert players with a distinct cackle, gibber, or howl; target one character; and will swiftly kill if not stopped by a teammate. Goin' to New Orleans: Valve paid renewed attention to level design and narrative.Few developers set the Uncanny Valley as a destination. Exempt from the taboo of mass human slaughter, the Infected — citizens foregone to epidemic psychosis — receive no charity from Valve. They aren't merely haggard and feral, as before. They've been feeding, or fed on; and showcase realistic results of bludgeoning and ballistics. Painstakingly viscous, oxide blood drips from mouths, streams out of gunshot wounds, and spews in curling jets after disembodiment. Gaining a few new firearms to select from, the Survivors can also grab clubs, fireman's axes, blades, and chainsaws to alternately clobber, chop, or fillet waves of the dearly half-departed. Games can't stand on special effects and changeups alone. Fortunately, Valve made these superficial improvements as it paid renewed attention to level design and narrative. Each of Left 4 Dead 2's five campaigns has, as before, its own campy playbill — but instead of a standalone pulp short with a pat beginning and end, is one chapter in a storyline. Peripety serves the needs of horror, delivering the Survivors back into danger, but the variety multiplies replay value and sweetens the charm of what are — by necessity — stock characters. Players still wind tortuous paths through buildings and landscapes, but the way is less obvious. Environments are broader, more complex, and, causing the rightful disorientation of unfamiliar places, more authentic. When characters call out to ascend stairs or climb across a platform, the sensation of trekking — and the anxiety it brings — is complete. The locations themselves are genuine, proper nouns like Savannah, Georgia; Whispering Oaks carnival; and New Orleans. As such, Valve draws on rich visuals, from highway interchanges that may as well have come from plans and specifications, to a would-be concert for a Black Sabbath look-alike, to fiendishly ironic jazz funerals and grotesque festoonery. Shoot to kill, technically: few developers set the Uncanny Valley as a destination.Valve's visionary artificial intelligence, the AI Director, again ensures that no two playthroughs are alike. This time a swarm of Infected will burst from the alleyway when the Survivors round the corner; the next time, from that manhole, and a second one will follow with two Hunters and a Tank. Precisely how reactive and dynamic the AI Director is can't be said — apart from the Director's penchant to release a mob of Infected on a dawdling party, much of the generation of enemies, weapons, and equipment appears random. Even so, Left 4 Dead 2 and its predecessor share the quality found in genre fiction: unpredictability. That Valve intends to apply this technology to other games — like Half-Life, which, for its magnificence, is unerringly linear — provides justification enough for a year-to-year, fine-tuned sequel. Collaboratively, forms of intelligence will be limited to friends and players joining cooperative and competitive multiplayer matches online. To be fair, AI-controlled Survivors are crack shots, never committing friendly fire and diligently freeing an incapacitated teammate. But they neither pick up nor use pipe bombs, Molotov cocktails, or a new crowd-control device, Boomer bile — let alone contemplating those lifesaving barricades of ignited gasoline cans and propane tanks. And with the occasional decision to heal a Survivor in far better shape than a single player, they suggest that Valve either has some way to go in trying to program cleverness; or would really rather you find four or more people with whom to play. No reason to complain. 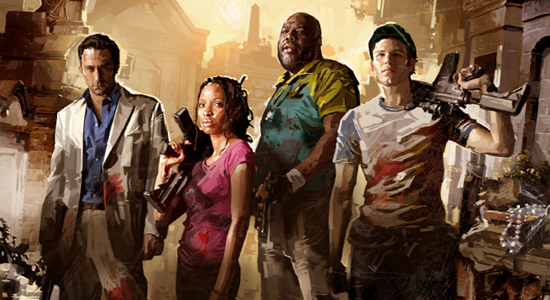 As most anyone who enjoys the original Left 4 Dead will argue, the game was meant to be shared — AI doesn't squeal, utter war cries, or chuckle over exploits when the safe-room door swings shut. As Left 4 Dead 2 evidences only a little reinvention, casual players of the first title might think it redundant; with its slightly better sequel, Valve has ministered to the avid fewer, "cult" and "classic" working here in mutual exclusion. But horror series — even the best — are by definition repetitious, and the audience in question hasn't turned away. Nice. I haven't seen anyone make the point that you left us with. Comparing what Vavle did in keeping this sequel on the safe side with the horror industry as a whole is totally valid. I enjoy looking at games as extensions of the genres that films have helped to establish. Games are much bigger than a lot of reviewers make them out to be.